The year 1968 is synonymous with protest and social change. This August, the world marks the fiftieth anniversary of the Warsaw Pact invasion of Czechoslovakia and the suppression of the Prague Spring. As a result of this sudden crisis, Canada resettled close to 12,000 refugees from Czechoslovakia between September 1968 and January 1969. This movement of individuals and families in search of refuge serves as an important case study in Canada’s history of refugee resettlement. It also provides greater context for Canada’s recent refugee resettlement schemes. Between 2015 and 2017, the federal government welcomed over 40,000 refugees who fled civil war in Syria. As the public debate surrounding immigration continues to focus on annual intake, immigrant desirability, refugee resettlement, and the entry of asylum seekers, a discussion of evolving bureaucratic notions of who is a ‘desirable’ immigrant is also timely. The Soviet-led invasion spurred thousands of Czechs and Slovaks to leave their country and seek safe haven elsewhere. Many of the individuals who left due to the events of 1968 were similar to a preceding movement of Czechs and Slovaks who fled the communist takeover of Czechoslovakia in February 1948. As experienced professionals and skilled workers–including politicians, diplomats, clergy, business owners, professors, and doctors–they held pro-democratic values and refused to live under a totalitarian regime. Many resettled in the West in the hopes of liberating their homeland from communism. At the height of the Cold War, when Canadians were overly vigilant against the arrival of undesirable individuals from the Eastern Bloc, federal officials were keen to admit anti-communist Czechs and Slovaks who had fled from the events of 1948. These newcomers were often celebrated by the Canadian public as ‘freedom fighters,’ but also mistrusted as potential communist sympathizers or spies. 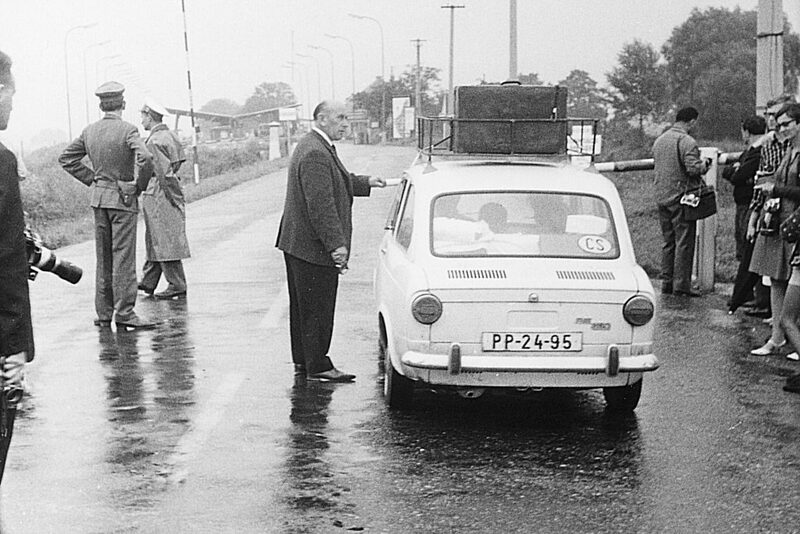 On the outskirts of Bratislava, a family prepares to cross the border into Berg, Austria (August 1968). International Organization for Migration (IOM). Those who left Czechoslovakia in 1968 had fled communism as a lived reality. They too held anti-communist values, but were more concerned with their ability to continue their professions and careers outside of their homeland. While relations between the West and the Eastern Bloc improved, Canadian officials were focused on the economic potential of these newcomers rather than their personal ideologies. But what about those Czechoslovak nationals who were travelling aboard on business or for leisure, and who decided not to return home at the time of the invasion? Since these individuals had not fled to a second country in which to claim asylum, they could not be considered refugees under the 1951 United Nations Convention Relating to the Status of Refugees. At the time of the Soviet-led invasion, Canada was not a signatory to the UN convention because it guaranteed asylum as a right under international law – and would have prevented Canadian officials from removing individuals deemed to be ‘undesirable.’ Yet, federal officials followed the spirit of the convention in guiding their decisions on refugee admissibility and resettlement. The federal government used the precedent established by the 1956 Hungarian refugee movement, to initiate another special program whereby federal officials relaxed admission criteria and provided help with transportation to Czechs and Slovaks who demonstrated interest in coming to Canada. Why has the movement of Prague Spring refugees been largely overlooked in Canadian historical writing? What makes this movement unique in Canada’s history of refugee resettlement? Why were refugees from Czechoslovakia referred to by Canadian officials as “good material,” and “a small gold mine of talent”? Why did federal officials seek out these individuals for resettlement in Canada? In order to answer these questions, we must first understand the reasons for their departure and why some Czechs and Slovaks who did not fit the convention definition were nevertheless considered as refugees by the Canadian government. After nearly two decades of communist rule, in which civil liberties were heavily curtailed, the economy became stagnant, and political change was suppressed, reformers within the Communist Party seized an opportunity to implement changes to Czechoslovakia’s political system. On 5 January 1968, Alexander Dubcek, a Slovak reformer, was elected as First Secretary of the Communist Party of Czechoslovakia. Due to the failure of the 1953 uprisings in Czechoslovakia and East Germany, the 1956 Hungarian Revolution, and the 1956 uprising in Poznan, Poland, reformist members of the Communist Party recognized that overt revolt against the hardline Soviet model of communism was hopeless. In March 1968, party reformers were bolstered when Antonin Novotny was replaced as president with General Ludvik Svoboda. The following month, Dubcek announced his political program, “socialism with a human face”, in which the communist system would be reformed from within. In the following months press censorship was abolished, civic freedoms were restored, citizens were free to exercise their religious traditions, and the political system was slowly liberalized. This period of communist liberalization in Czechoslovakia became known as the Prague Spring. Overnight on 20-21 August, Warsaw Pact forces consisting of approximately 170,000 troops and 4,600 tanks from Bulgaria, Hungary, Poland, and the Soviet Union invaded Czechoslovakia to suppress the Prague Spring and implement ‘normalization’ across all sectors of Czechoslovak society.3 The Prague Spring reform movement which had begun with Dubcek’s election as first secretary lasted seven months, two weeks, and two days. Western governments including Canada had ruled out a Soviet invasion in part because of improving relations between East and West, and the condemnation that such an action would bring from the international community. Federal officials became aware that approximately 80,000 Czechoslovak nationals were outside of their country at the time of the invasion.5 Many of them were professionals and skilled workers conducting business on behalf of companies back home, and students who were studying abroad, while other individuals were on vacation. Due to the invasion, many of these individuals and families decided to remain abroad. With Czechoslovakia’s borders open, thousands of their compatriots decided to leave and sought asylum in Austria, Yugoslavia, Italy, and other European countries. Heavily influenced by its own political and economic self-interest, the Canadian government soon recognized that a humanitarian crisis was unfolding. Canadian officials hoped to permanently resettle many of the professionals, skilled workers, artists, and university students before American, Australian, British, French, Scandinavian, and New Zealand officials were given an opportunity to process them. Since many of the Czechs and Slovaks were already abroad at the time of the invasion, the office of the United Nations High Commissioner for refugees hesitated to define these individuals as convention refugees. This was not the case for Canadian officials who manipulated the definition of a refugee to include Czechs and Slovaks who were already abroad at the time of the Soviet-led invasion. The Prague Spring refugees for their part were also opportunistic. In some cases, individuals and families went ‘embassy-shopping,’ speaking with diplomatic officials from various Western countries before making a final choice about their resettlement. For some, the decision came down to how quickly they could be permanently resettled and how well they were received by Western officials. In some cases, Prague Spring refugees had found the reception provided by Canadian officials to be the most welcoming, further cementing their choice to come to Canada. Immigration officials used the 1956 special program for Hungarian refugees as a precedent in establishing a similar program for Prague Spring refugees. Canadian immigration officials relaxed admissions criteria, including medical examinations and security screening, and offered assisted passage to help bring Czech and Slovak refugees to Canada. Former Canadian immigration official Michael Molloy recalls arriving in Vienna three days after the Soviet-led invasion. Molloy had joined the immigration foreign service that same year and recalls that Canada’s initial response to the crisis was slow. After a week of waiting for prospective refugees, they began to arrive at the Canadian embassy. Molloy spent the following four weeks, from dusk to dawn, signing thousands of visas to permit Czechs and Slovaks to resettle in Canada.7 Between 8 September 1968, when the first group of refugees arrived in Canada, and 10 January 1969, when the special program was terminated, close to 12,000 refugees were brought to Canada. The resettlement of the Prague Spring refugees remains one of Canada’s largest coordinated postwar refugee movements. It is one example of the varied nature of bureaucratic responses to refugee admissibility and resettlement in Canada. In the case of the Prague Spring refugees, many of them were brought to Canada as political refugees who had fled the Soviet-invasion of their country. Yet, some were already abroad at time of the invasion and did not flee their homeland due to the invasion, nor did they meet the conditions to be deemed as convention refugees. For its part, the Canadian government had become aware that highly qualified individuals with professional backgrounds had desired to be resettled in the West. In providing a humanitarian response, Canadian officials manipulated the UN refugee convention definition to bring many of these Czech and Slovak professionals, skilled workers, and university students to Canada. Since then, Canada has continued to resettle refugees in times of sociopolitical upheaval, including over 7,000 Ugandan Asians (1972-1973), some 8,000 Chileans (1973-1978), and over 77,000 Vietnamese, Cambodian, and Laotians (1975-1981). In autumn 2015, the Canadian government announced its commitment to resettle 25,000 Syrian refugees, most of whom were Muslim, and prioritized married couples, families, and children. Omitted from this movement were single males, due to a bureaucratic fear that they might hold extremist beliefs or connections to terrorist groups. When thinking about Canada’s history of refugee resettlement, we should consider how evolving bureaucratic notions of immigrant desirability have shaped which individuals were considered admissible for entry into Canada. This is particularly important in our post-9/11 world, in which Muslim refugees have often been considered in the West as ‘undesirable’ individuals despite their desire to attain sociocultural citizenship in their new country. 1. Gerald E. Dirks, Canada’s Refugee Policy: Indifference or Opportunism? (Montreal: McGill-Queen’s University Press, 1977), 233–34, 255; Victor Malarek, Heaven’s Gate: Canada’s Immigration Fiasco (Toronto: Macmillan, 1987), 102; Reginald Whitaker, Double Standard: the Secret History of Canadian Immigration (Toronto: Lester and Orpen Dennys, 1990), 6-9; Freda Hawkins, Canada and Immigration: Public Policy and Public Concern (Montreal: McGill-Queen’s University Press, 1988), 384; Harold Troper, “Canadian Immigration Policy since 1945,” International Journal 48.2 (Spring 1993), 271–72. 2. Laura Madokoro, “Good Material: Canada and the Prague Spring Refugees,” Refuge: Canada’s Journal on Refugees 26.1 (2009), 168; Jan Raska, Czech Refugees in Cold War Canada: 1945-1989 (Winnipeg: University of Manitoba Press, 2018), 145-146; Peter Whelan, “203 from Czechoslovakia Combine Joy and Sorrow,” Globe and Mail, 16 September 1968, 1–2. 3. Jeremi Suri, “The Promise and Failure of ‘Developed Socialism’: The Soviet ‘Thaw’ and the Crucible of the Prague Spring, 1964-1972,” Contemporary European History 15.2 (2006): 153; Geraint Hughes, “British Policy towards Eastern Europe, and the Impact of the ‘Prague Spring’ 1964-1968,” Cold War History 4.2 (2004), 126. 4. Library and Archives Canada (hereafter LAC), Privy Council Office (hereafter PCO) fonds, RG 2, Series A-5-a, vol. 6338, file “Cabinet conclusions,” item 4365, title “Situation in Czechoslovakia,” 21 August 1968, 4. 5. Louise Holborn, Refugees: A Problem of Our Time: The Work of the United Nations High Commissioner for Refugees, 1951–1972, vol. 1 (Metuchen, NJ: Scarecrow Press, 1975), 516–17. 6. LAC, PCO fonds, RG 2, Series A-5-a, vol. 6338, file “Cabinet conclusions,” item 4431, title “Czechoslovak Refugees,” 5 September 1968, 8. 7. Oral History with Michael Molloy, 3 December 2015. Canadian Museum of Immigration at Pier 21 Collection (15.12.03MM). Confronting Canadian Migration History by Jan Raska is licensed under a Creative Commons Attribution-ShareAlike 4.0 International License, except where otherwise noted.